Prayers: A Communion with our Creator (eBook) - Amber-Allen Publishing, Inc.
Now in this beautiful slender volume, don Miguel Ruiz offers a selection of prayers, guided mediations, and inspiration on Truth, Forgiveness, Love, Gratitude, Humanity, and Inner Silence. 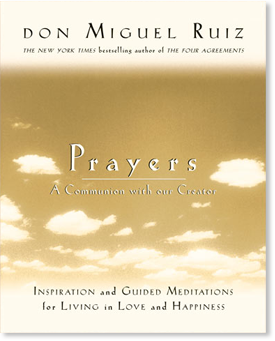 Just as don Miguel always begins his lectures with a prayer or meditation to invoke a receptive frame of mind, the intent of this book is to guide the reader to experience a silent communion with our Creator. Prayer fulfills the need humans have for God, for inspiration, for affirmation of our own spirits. In prayer, we communicate with the essence of everything that exists, including our own essence.